Here are the postcards and snapshots that Stringbean Coe and his brother Fred sent home from the long trip they made one summer in Fred's truck. Their grandfather made this album for the family--and for you. Enjoy yourselves! Stringbean Coe, his big brother, Fred, and their dog, Potato, are driving from Kansas to California in a pickup truck with a little house built on the back. Reading the postcards they send home every day is the next best thing to having a cross-country adventure all your own. 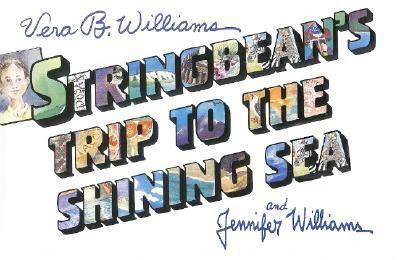 Vera B. Williams is the creator of many distinguished books and was the U.S. Illustrator Nominee for the 2004 Hans Christian Andersen Award. She lives in New York City. "Throughout my childhood I was encouraged to make pictures, tell stories, act, and dance—all of this at a heaven in our New York City neighborhood called the Bronx House. "On Saturdays I painted with a crusading art director, Florence Cane. In her book The Growth of the Child Through Art, I appear under the name Linda. I was sixteen when the book appeared and embarrassed by it. But at age nine I had been totally proud when a painting of mine was exhibited at the Museum of Modern Art and I was later shown in the Movietone News explaining to Eleanor Roosevelt its Yiddish title, "Yentas." "In 1945 I went to Black Mountain College in North Carolina, a unique educational community. I graduated in 1949 in graphic art, which I studied with Josef Albers. Along the way I planted corn, made butter, worked on the printing press, and helped to build the house in which I lived with Paul Williams, a fellow student I married there. "I wanted that connection of art and community to continue. And it did at the Gate Hill Cooperative, a community we built with other Black Mountain people—a poet, musicians, and potters. I lived and worked there from 1953-1970 (after which I moved to Canada). My children (Sarah, Jenny, and Merce) grew up there. For them, we branched out into a school, part of the Surnmerhill movement. The gingerbread houses that led to my first book for Greenwillow I first made in sticky variety at our school. I have always liked to teach, and have taught art, cooking, writing, and nature study, for nursery age on. "At forty-six, no longer married, living in a houseboat on the bay at Vancouver, British Columbia, I did my first book. But before that could happen, the fates decreed a stint of cooking and running a bakery at a small school in the Ontario countryside. My love affair with Canada included also a 500-mile trip on the Yukon River. Many of those adventures I put in Three Days on a River in a Red Canoe. "I also write and draw for adults-short stories, leaflets, and posters. As a lover of children, I try to do what I can to help save their earth from nuclear disaster. This pursuit, too, has added its excitement to my biography, including, in 1981, a month's stay in the federal penitentiary in Alderson, West Virginia (an outcome of a women's peaceful blockade of the Pentagon). Perhaps this experience will some day appear in one of my books. So far I've found children's books a wonderfully accommodating medium where any of my various activities might pop up."